Energy Efficiency: Builder Tips For a Tight Home - Armchair Builder :: Blog :: Build, renovate, & repair your own home. Save money as an owner builder.- Armchair Builder :: Blog :: Build, renovate, & repair your own home. Save money as an owner builder. If you live in a cold climate you really start to think about the energy efficiency of your home this time of year. When you sit down to pay the bills and see your electric or gas bill has skyrocketed, you start thinking of ways to improve your home. Building a new home or addition allows you to build energy efficiency in without spending a fortune…as opposed to retrofitting your existing home. Here are some tips for building energy efficiency into your new project. 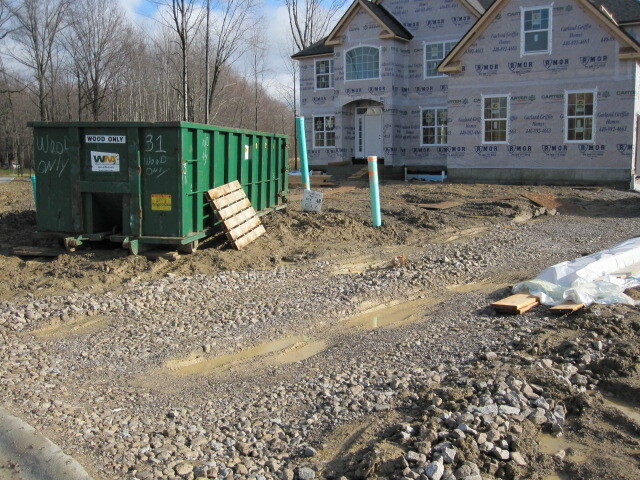 Housewrap: You’ve probably driven by houses under construction that have a paper or fabric nailed to the outside walls. This is typically housewrap and is designed to serve two functions. First, the housewrap serves as a secondary protection if any water gets behind your siding (and it will). The housewrap helps keep the water from making its way into the wall. Second, the housewrap helps keep drafts out of your home. If you’ve ever seen a carpenter build a wall, you know how many cracks and gaps there are in the typical home. Properly installed housewrap helps slow down air infiltration by covering all of the gaps. I like to compare it to that windbreaker you wear in the spring to keep the chilly wind from getting to you. Foam/Caulk: All cracks, holes and gaps should be sealed up with an expandable foam or caulk. You know that gap at the bottom of a wall between the subfloor and the wall? That gap should be caulked. Every now and then I go into a home where this wasn’t done that has a light colored carpet. The carpet can become dark along these walls because the carpet fibers are acting like a filter as the air travels under the wall. Those electrical outlets on exterior walls should also be sealed behind them with expandable foam (the knockouts where the wires enter the electrical box should also be foamed). This will help prevent the cold air you feel when you go to plug in that lamp on an outside wall on a cold day. The holes in the top of all walls, both interior and exterior should be filled. This includes foaming around all wires/conduit/pipes that leave the wall and go up into your attic. Once drywall has been hung, you should seal up around any cutouts in the ceiling drywall. This would include caulking around all electrical boxes, recessed can lights,…etc. Enclose Fiberglass Insulation: I was storing some stuff in my mom’s attic over the holidays and noticed the fiberglass batt insulation in the walls were exposed adjacent to the vaulted area. 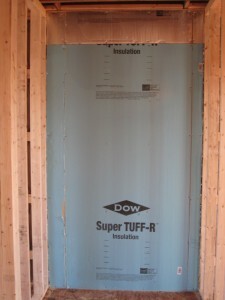 Fiberglass batts are a good type of insulation…but they are not an air barrier. So, you need to enclose the insulation on all six sides for maximum effectiveness. So, any vertical walls in your attic space should have an air barrier installed over the studs enclosing the insulation. Different types of air barriers include drywall, plywood, foam sheathing…etc. In the picture above, we see the framing for a future bathroom. 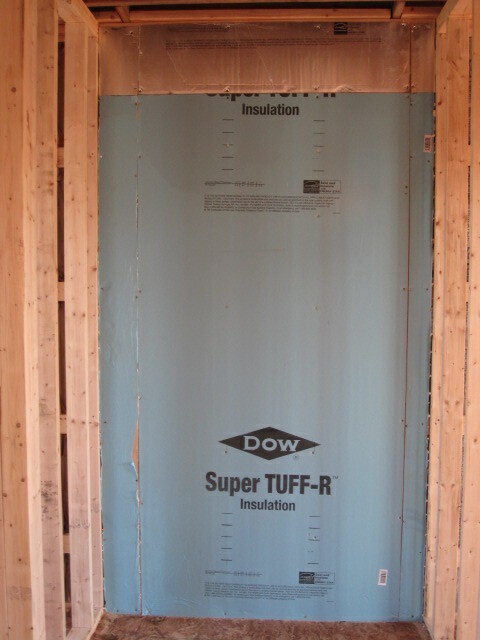 The blue insulated sheathing is the exterior wall for the future fiberglass shower. This sheathing is enclosing the fiberglass insulation so it will work as intended. This is a great practice for energy efficiency in any new building project. Energy Corners: When your new project is being built, it’s important to pay close attention to the framing at intersecting walls and corners for maximum energy efficiency. In the picture above, the interior wall intersects the exterior wall with what we call an energy ladder. By installing the horizontal 2×4’s in the wall cavity, we can secure the intersecting walls and still insulate the exterior wall. 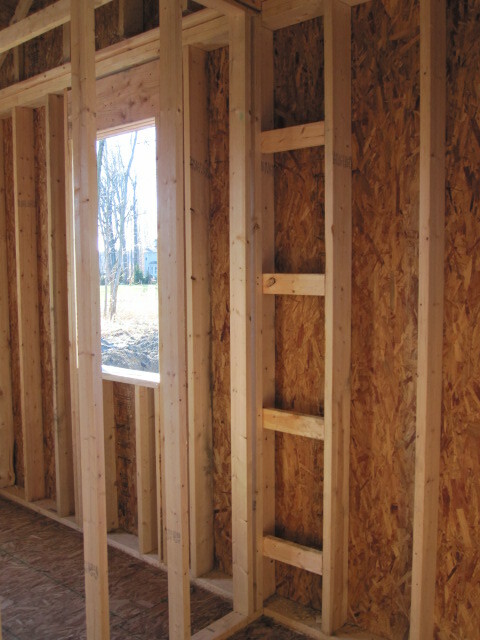 If you were to run the interior wall all the way out to the outside wall, you would be left with a 5″ wide area of wood…and since a wood stud only has an R-value of about 4 (versus R13-14 for the insulated wall) that portion of the wall will be cold. Do you have corners in your home that appear dirty after it gets really cold outside? This can happen when a corner is cold due to poor framing and insulation techniques. The wall actually gets so cold that water condenses on the surface…and dust sticks to it. Another example of a framing technique for maximum energy efficiency is the california corner. 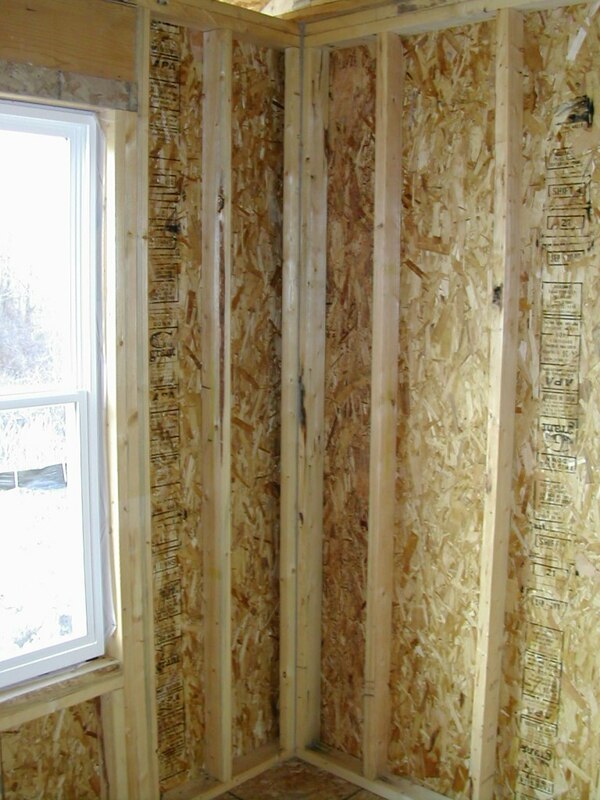 In this case, two exterior walls that intersect in a corner are framed so that insulation can be installed right up to the corner. You want to eliminate having too much wood and too little insulation and the California corner accomplishes this.